perennial crops (fruits, grapevine...) or annual field crops. Specific solutions exist in both cases. We use the most recent technological possibilities to bring the highest possible Return On Investment (yields / quality). Multispectral imagery is our primary focus because UAVs can provide high-value data. UAVs are definitely better than satellites and plane solutions because of better spatial AND time resolutions. Once Multispectral images are correctly collected and analysed (you have to know what you are looking for to make sure you get the good data), zones are defined in terms of biomass and other vegetation indices, soil analyses are performed and all these data are correlated to ground-truthing observations. Then efficient solutions can be proposed. Water is the most important factor for plant growth/productivity. Water is the carrier of everything to the plant and its main defense against "drought" conditions. A strong focus on water is required in situations of irrigation or not. We take care of irrigation management and draining evaluation. Soil communities (micro-organisms : bacteria and fungi) is important for several reasons : soil life brings nutrients to plants and helps plants in its defence against biotic and abiotic stresses. A balanced soil micro-community favours a balanced soil macro-community. We evaluate soil microorganisms composition by sequencing technologies and select micro-organisms add-ons to eventually recover a balanced soil life. Plant growth scenario can be intensive or biologic. In both cases soil composition needs to be assessed in order to avoid the lack of an indispensable nutrient. We select soil sampling locations, analyses to be performed and we integrate this data in the precision project. Decisions about amendments depend on the chosen scenario (see above) by the farmer. Weather data -past / present /forecast- is integrated within the proposed solutions. While we cannot act on weather 😉 , we have to do our best to avoid detrimental situations (water-logging/prolonged drought) by a correct water management process. 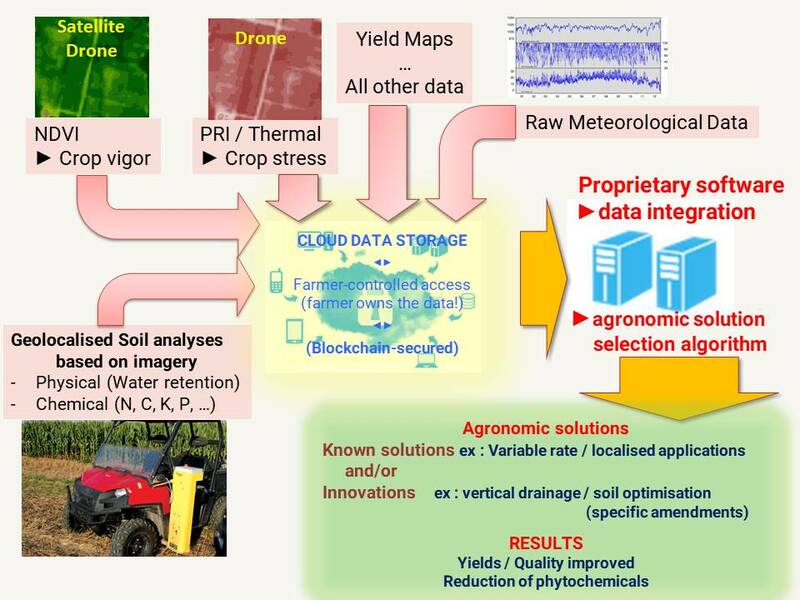 We have devised a proprietary algorithm to analyse these data and propose agronomic solutions. Once important factors have been identified and corrected, several seasons are required to fine-tune the applied solutions which depend on meteorological events. In situations of irrigation or not, drainage evaluation is important for yields (and quality in the case of grapevine) and pathogen control ! Water is the carrier of everything to the plant and is its only defense against drought ... It is the most important factor for the plant. First we measure factors we consider as relevant depending on ground-truthing and farmer's experience of his land. We then use various technologies to act locally (ex : vertical drainage, variable inputs). But beware that your site is unique and requires a specific approach if you want your precision agriculture project to be efficient. The "one size fits all" approach commonly provided by consulting firms is only partly efficient even if it is presented as site-adapted (NDVI based variable input). We provide site-specific consulting with the highest chances of increased ROI. We apply the Concept-knowledge theory to precision agriculture matters. This gives us a clear advantage in the innovations we can propose. Knowledge has to come from a multi-disciplinary approach. We integrate carefully selected data in our precision agriculture projects.